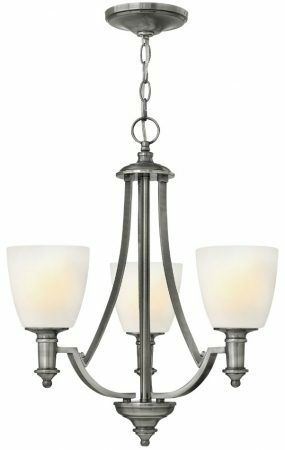 The Hinkley Truman 3 light chandelier in antique nickel finish with Art Deco style is sophisticated and stylish. Featuring a handsome symmetrical profile created from the ever so slightly curved panel arms, which stem from the cupped top finial ending just below the typical Art Deco step supporting three torchier style arms, with upward facing etched opal white glass shades. The sophisticated style of the Truman collection features boldly sloped arms that uniquely contrast with its elegant cast finials. 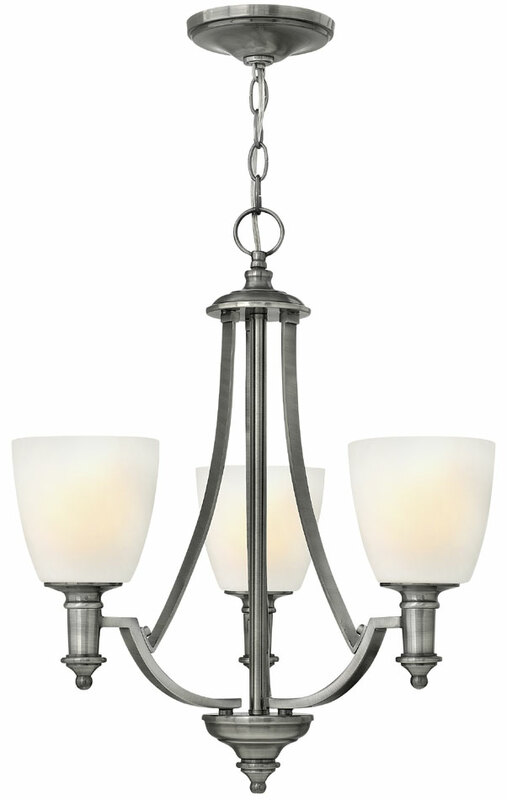 The antique nickel finish highlights the beautiful etched opal glass shades. Re-create the new era of modernization from the roaring 1920’s with this sophisticated lighting suite, full of Deco influence – bursting with quality. Substantial opal etched glass shades stimulate the need from the deco period to create simple, plain sophistication. Supplied with 152cm of chain that can be shortened at the time of installation. There are matching fittings in the Truman lighting collection; please see below. Designed in the USA by Hinkley Lighting, founded in 1922 in Cleveland, Ohio. Their long heritage combines with a pursuit of innovative design to create modern and contemporary lighting such as the Truman 3 light chandelier in antique nickel finish with Art Deco style featured here.